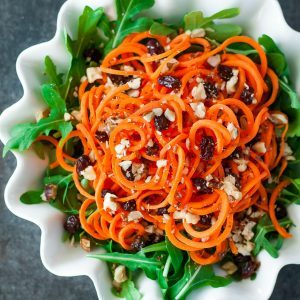 This healthy carrot salad is spiralized and served atop a bed of mixed greens with juicy raisins, crisp candied walnuts, and a lemony homemade dressing. It's delicious! Recipe yields 2-4 side-dish sized salads, ready for facepantage! FOR THE SALAD: Wash and peel your carrots, then slice via your favorite method. I used my spiral slicer since carrot noodles are so flipping fun! You can use a food processor or box grater to shred the carrots or even use a veggie peeler to make carrot ribbons. All methods work gloriously! Pile atop a bed of mixed greens and sprinkle with raisins. CANDIED WALNUTS: Heat a skillet or saucepan to medium heat and butter to melt. Next add in your walnuts, honey, salt, and sugar. Saute for 5-6 minutes and pour over parchment paper, using a spatula to separate the nuts. Otherwise you'll have yummy walnut brittle that you'll want to break apart over your salad, which is no big deal either! Yum! Allow to cool for several minutes until the coating hardens and you're walnuts have officially been candied! Woot! Try not to eat them all before they hit the salad. DREAMY DRESSING: Pour all ingredients into a mason jar and shake to mix! That's it! Alternatively you may whisk the ingredients together in a bowl. Give it a taste, adjust seasoning to taste and pour over your salad. dressing adapted from once upon a chef. For perfect orange spirals, grab the biggest carrots you can get your hands on. Some stores will sell them a la carte while other times you can score jumbo carrots at the farmer's market! After washing and peeling, cut off the ends on each side, leaving the thickets part of the carrot in tact while it curls through the spiralizer. The result will be a pile of smaller curls with a glorious stack of giant spiral carrots on top. Use both for the salad! Hooray carrots!